Business cards for Stand-Up Comics, Keynote Speakers, ventriloquists and other solo acts should match basic design of your web site, stationery, etc. When do you need to get business cards? or other public performance of your comedy act or business keynote speech. open mic, showcase, one-nighter, new full-time comedy club, etc? 3.5" x 2" which is more like 3 3/8" x 1 7/8"; i.e., less 1/8" inch all around. and gutters (space between the cards in the layout). MS Word, Adobe: Photoshop, Illustrator, InDesign, etc. at FedEx office or a similar print shop that will let you use a paper cutter in their shop. By "controlling the means of production,"
•while keeping the cost of each card low enough to freely give them away. •and you can vary the font color. "Comic, Stand-Up Comic, Keynote Speaker, Magician, Juggler, Ventriloquist, etc." Keep this updated, toss outdated business cards. •No waiting to update your publicity = same day turnaround! If you change phone companies, make sure your original phone number travels with you. •Test to verify by sending yourself a test email. •have your best video or a direct link to that video. •Never rely on freebie web sites, not even youtube.com. •and change their email addresses. even if your Internet Service Provider (ISP) goes belly up. ISP fees vary: $10-20/month to keep getting access to your email. Be professional by not using your social media or other freebie email addresses for business purposes. •you are a stand-up comic, etc. This, so bookers do not need to remember to call you again. and he will get your gig. Updated May 11, 2014: in the first quarter of 2014, Facebook without any warning changed the default settings on everyone's About page. 99 out of 100 users seem unaware of this vital change. •Your "Contact Information" is now hidden. •Even if you click "See All," your professional email, web site addresses, etc., remain hidden to both your Facebook Friends and the Public. This is a great privacy protection. But terrible for folks like comics and speakers who want their professional information publicly available so they can easily get hired. Solution: change your default settings back to reveal your contact information. •the only way they can reach you is through Facebook Messages. This requires the comedy or speech booker to go through extra steps, assuming they will. never require the user to take extra steps to find your professional phone number, etc. •and on the Home page of their web site. I am not an expert on Facebook settings and I am not a Facebook developer, nor do I have any special information on Facebook updates. My information above re. : the default setting change in the first quarter of 2014 is just a conclusion I have reached from casual observation. 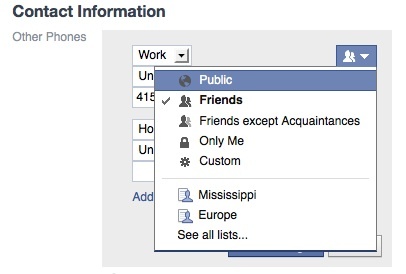 Read Facebook's help instructions on "How do I control who can see my contact info on my Timeline?" This will bring up your About page in Editing mode. You will then need to change each item for your Contact Information. Click the "Edit" button for each section for Phone, Address, Website, Email. In the screenshot below, you can only see the Edit button for Phones. To see the Edit button for Address, just move your cursor down to the Address line. Note that I have selected "Friends" rather than "Public" for who can see my Work phone number. 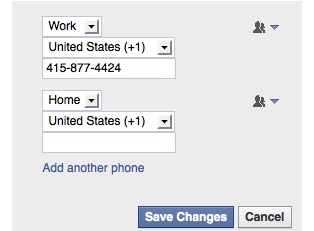 This mean that only my Facebook Friends can see that particular phone number in my Contact Information. You can select different Privacy settings for each of your Phones, Addresses, Websites, Email addresses, etc. So, think before you leap! Trust but verify that your "Contact Information" is now revealed on your About page as expected. Then, to make doubly sure, check out your updated About page on a friend's computer from your friend's Facebook account. always try to get someone to access your About page using their (not your) Facebook account. Then, look to see what is on their computer or mobile device screen. •and folks who are not yet your Facebook Friends. yesterday's desktop and laptop computers are no longer the target audience. •Design your web site for "mobile first!" •Has a layout designed for the smaller screens on smart phones, etc. •Provides alternatives to Flash content which is prohibited on Apple iOS iPhones, iPodTouchs and iPads. Notice that all videos on this newer web site are in both Flash and iOS-friendly video formats. •but the percentage of computers that can play iOS video formats is much lower. Therefore, to include all users, whether on computer or mobile devices . . . you get the idea. Well, some "smart" phones can't even . . ..
A short phrase that sells your persona. Business cards, stationery, web site Home Page and all other pages on your site, etc. It takes longer than you might think to get a business card out of your wallet, purse, briefcase, etc. Better to have at least 5 business cards in your jacket or shirt pocket. Anyone who asks for a business card might be thinking of hiring you for a private party. •So, be more than willing to give anyone your business card. Well, within reason: not to drunks and other jerks. and can often schedule you earlier in the evening than your club work that night. You still get your club pay for that night! 10 times or greater than your club pay. to perform at their party, convention, etc. •"Available for private parties, roasts, conventions," etc. Nothing like the power of suggestion! that will later remind them when & where they met you. and hired me on the spot. and what you chatted about. Try to get their business card. •and snail mail them another note before a day goes buy. Such consideration can prompt an immediate hiring. •read it before you put it in your wallet. •this is probably your only chance to ask them for clarification! but in a few years it may still earn you . . . $10,000! Page last updated: Thursday, February 20, 2014, 3:36 pm PST and Sunday, January 6, 2019, 6:49 pm PST.